HDR is one of the more divisive post-processing techniques in modern photography. Many love it and use it all the times while others will describe it as unnatural and ruinous. So which is it? I suppose the first question should be WHAT is it? HDR stands for High Dynamic Range and as the name suggests it is a set of post-processing techniques to produce a greater range of luminosity in an image than a standard image would normally show. It can often be done in camera these days – even iPhones have a HDR mode – but is most often done in post-processing with software such as Photoshop or Photomatix. The idea is that processing it allows more details in the image by combining a number of differently-exposed images, which allows the shadows or highlights (bright or dark areas) in a “normal” image to display more data. So why is HDR frowned upon so much? It’s a good question, and a difficult one to answer dispassionately. Some people absolutely love it and use it all the time, others will say it gives an unnatural effect and ruins an image. I personally believe both arguments are valid. HDR has a place in photography, especially these days with all the magic that can be done in Photoshop, but is something that should be used with caution. Time and a place and all that. It is also very easy to “over-do” HDR, and I can look back through some of my older images and shudder at the processing I made on them back then. So, two images both taken at night with a variety of colours and reflections in the water and on the buildings. Both look pretty similar in quality, with none of the obvious ghosting around the sharp edges or excessive contrasts and graininess that a HDR image can show. The London Skyline shot is however in HDR, and the Dolphin Hotel is a straight image. Of the two images the Dolphin Hotel is much brighter and more evenly lit, so was easier to extract the data in a single shot. London had many different levels of lighting ranging from the brightly lit dome of St Pauls to the much dimmer arches of Blackfriars Bridge. 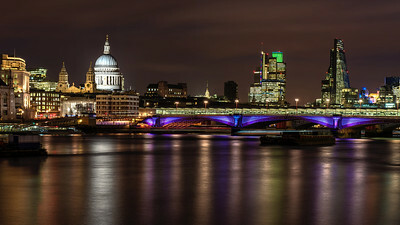 The human eye will have seen the London skyline pretty much as that photo on the right, but then the human eye can take in much more information and light than the sensor on a digital camera. A human eye can see up to 12 stops of light, which the camera is limited to around 3. This is where the HDR bit becomes useful and can help to extract more data from a scene, especially one with large differences in light from the darkest areas to the brightest. You can see here clearly the different light ranges the three images have captured. Using the dome of St Pauls as the guide, the “standard” image on the left is not too bad, while the middle image is clearly over-exposed. The image on the right has the most detail for the dome, and also many of the other lights visible, while the buildings are more clear in the middle image. So it’s the best bits of the middle and right images that will be merged with the standard image to increase and correct the level of detail. How to merge it all though? If you are feeling brave then you can do it all manually in Photoshop using layer masks and any other amount of wizardry. I’m not so good with Photoshop though, I can just about clone something out – most of the time. Photoshop has a HDR function built in too, but I use a program called Photomatix to do the merging. Photomatix works as a standalone program or as a plugin within Aperture which is my default photo library and editing software on the Mac. Simply load the three images into the software, answer a few simple questions on alignment and deghosting, and it does all the hard work. Once at the main page you have a variety of presets to enhance the image with ranging from Natural – which I use most of the time – to the more extreme HDR examples such as “Painterly”, which gives a more recognisable effect. Once I’ve selected the best preset I then use the sliders to tweak the image and get the settings just as I want them. Once this is done the image is processed and you have a final set of options to add sharpness and contrast. Both can come out on the low side from a HDR image, the sharpness especially. With the London Skyline image I first adjusted all the bracketed images in Adobe Camera Raw, correcting them for colour, contrast, shadows and highlights plus the Lens Correction. Although the originals are only small you will probably notice that I spent a lot of time removing the most populous item on the London skyline generally right now – the cranes. There are soooooo many of them! So when shouldn’t you use HDR? Again, it’s all down to taste really. HDR works best where there is a lot of light change from the darkest to the lightest, so portraits and pictures in the park on a sunny day might not work for it. Moving objects in an image can be difficult to make good HDR images of, although the Photomatix software does manage to remove ghosting (where a person has moved from the first to the third image for example) quite well. It’s all down to experimentation really and what the photographer likes to see from the final image. For a far more comprehensive – and humorously written – tutorial on HDR with some awesome photographs to boot I’d recommend taking a few minutes to look at Trey Ratcliff’s HDR tutorial – it was the starting point for me to figure out how to get the best out of the technique, he also has some handy discount codes for the software. If you want to see more examples of my HDR work, click on the Search button on the left and enter “HDR”. You’ll be surprised at some of the images that I’ve taken that are HDR. You should also be able to figure out quite quickly which ones were my earlier efforts at the method! Well, that took a while but finally have my “Unsorted” folder back empty, and as a result about 60GB of space back on my hard drive! I use Aperture on the Mac for all my photo editing, Photoshop is available but is used only if I need to do something exotic. I have a workflow that I use which involves putting all of my raw images into an Unsorted folder and then looking through and flagging those I deem worthy of editing. Once edited I move them into their own folder and then tag, caption, title, geotag and face tag them all so I can search my library quickly. Only then do I publish the images here or onto sites such as Flickr. If I want to get an image online quickly I still do the same but just for the individual image. Then others will join it in the folder once edited. When I believe I’ve finished with a project I then go back through the Unsorted folder again to see if there is anything I’ve missed or that is good enough to keep for whatever reason. Then the big moment – deleting the junk. By the time I come to empty the folder I have a Time Machine backup and a Crashplan backup on the Internet, so it isn’t a big deal – but selecting images and hitting the delete key is a scary moment. Over 500 were deleted from Abbey House Gardens alone, and I know some people would say to keep all – but space will quickly become an issue.